The place to get everything you need to support what we do! Who’s thirsty? Who’s wants to represent their favorite UTV magazine? Well we have the solution! There’s never a reason to not have another cup on deck to fill with that tasty beverage. At 22oz. there is enough in your hand to avoid those awkward moments to leave the party for constant fill ups. The bright orange color makes it recognizable from those pesky red solo cups that break under pressure anyways. Need reusable cups for beer pong, these work great for that too! Add some style to that headwear collection with this acrylic/wool blend flat bill hat. The mid profile structured build makes for a snug formed fit, and with it’s snap back closure makes it one of those One Size Fits ‘Most’. 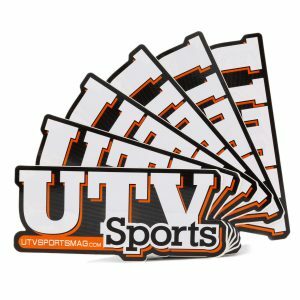 The heathered grey/black fabric blends perfectly into the black 3D puff embroidery of the script “UTV Sports” front and center. Good looking no matter what you wear it with. Wear it proud, we sure do! This 24-pack cooler includes two extended, outside dry pockets. Perfect for phones, snacks, dry goods, supplies, and other items you need for a day of riding. As the name incinuates it will hold 24 cans plus up to 14 pounds of ice. 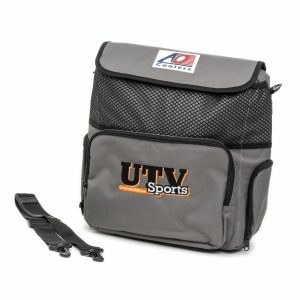 Includes removable Shoulder Strap Clip-Down ends, and provides twice the insulation of other soft-sided coolers. This thing is guaranteed to hold ice for 24 hours in 120 degree weather! Perfect for the desert! Also use this as a “River” bag. Throw your drinks in the cooler and put your clothes for the weekend in the side bags, perfect for day trips. Use this cooler to keep things warm as well ***Meets airplane carry-on requirements! Do you want to brand us in a big way? Listen up… Sometimes you build something for one propose, and it succeeds in another. We originally made these hats for our female staffers at events to wear to make sure that logo was big and bold and could seen from afar. Well, we got more requests for these hats from our female and youth readers than we did for the more subtlety branded hats. So, here we are making them available to you! These bright and bold truck style hats have a mesh back for cool wearing and a velcro back closure to make them adjustable in size with ease. As they say, bigger is better right?!?! The good ‘ol basic black tee… with a smile. There’s definitely no doubt that we’re all smiles when we jump in that UTV, so we decided to print that and share. This 100% cotton preshrunk tee is nothing fancy, but shares our message. The single imprint on the front is big and bold. We’re big fans of seeing these out on the trail, grit in the teeth and all. We know our favorite ladies like to look pretty but yet ride dirty, and this shirt clearly expresses that. This premium combed cotton shirt is cozy soft to make it crazy comfortable. With 3 different decoration spots, there’s a clear message from all perspectives. We are dog lovers, and want our 4-legged friends to be able to represent. Rather than make cute little sweaters, we decided to make something they can wear proudly and can help you keep them within your reach. The very rugged 1″ wide design is practical in every sense it can be for a collar and leash. The collar is adjustable in length from 17″ – 24″, generally for medium to large size canines, with a robust D-ring and quality plastic snap buckles. The leash is friendly 48″ long with a loop handle and a D-ring to snap on those handy little clean up bag containers. Cause we need to always pack out what we pack in, right? As off-road and outdoor enthusiasts we are outside most of the time and that means we are under the sun a lot. 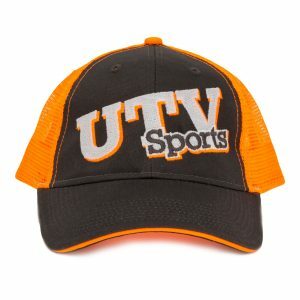 Protect your head while representing your favorite UTV magazine! A win-win! This structured flat bill cotton twill New Era 9FIFTY hat is an iconic look, and we add in that 3D script logo to make it even better. One Size Fits Most.